They sleep under bridges and hide in vacant door ways. And you’re no longer needed. moving out of our way. Why Have a Homeless Veterans Work Group? The homeless situation continues to worsen in the United States. 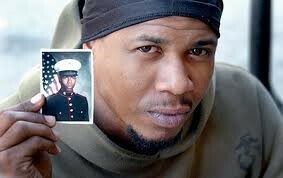 Approximately 30% of all homeless are veterans. More soldiers are returning from Iraq and Afghanistan and many of them are suffering from post traumatic stress disorder (PTSD), traumatic brain damage (TBD) alcoholism, moral fatigue, drug abuse and depression. In most cases these maladies are artifacts from the horrific events they witnessed during their tour of duty. As a result, many will not be able to cope with civilian every day life situations such as the stress of the workplace and as result will wind up homeless and in an environment that could cause them to run afoul of the justice system. As an organization one of our goals is to: “Seek justice for veterans and victims of war”. To act as a vehicle in aiding all the chapters of Veterans for peace, by providing tools that can be used to help homeless veterans and their families. Our work group will be the repository for various “Best Practices” (proven ways to help the homeless) These Best Practices, gathered from various chapters throughout the United States, have already been proven to help the homeless. Bottom line, it will enable any chapter in the United States to adopt one or more of these Best Practices and put them into play in their cities. The Best Practices for Helping our Homeless Veterans document contains a listing of “Best Practices”. Please feel free to review them and select a practice(s) that you believe that you and your chapter/organization can institute in your city. Keep in mind that although we have provided you with details concerning the “Best Practices”, you might still need some additional guidance. Feel free to contact the person who created the “Best Practice” and he/she will provide you with additional information that you may need to successfully launch a program in your chapter and city. Please keep us informed on how successful you were in your efforts and inform us of any ideas on how we can improve the process of communicating these “Best Practices”.